Quasar® Plus Sensor Loupe® 7x Magnifier is an improvement to Quasar Sensor Loupe 7x. The ED Glass (Extra-Low Dispersion) lens in Quasar® Plus Sensor Loupe® 7x Magnifier has been lowered for a better and improved focusing system for sensors placed in deeper cavity. Quasar® Plus Sensor Loupe® 7x Magnifier comes with a 52 mm metal ring to attach filters and close-up lenses for higher contrast and magnification. For example, using amber filter effectively blocks blue light increasing the contrast and reducing the glare accompanied with sharper image and less strain to the eyes. Blue light blockers are ideal for low vision users. The attachment of UV filters can enhance image clarityand protecting the ED glass lens. The attachment of polarized filter can be helpful in distinguishing stain from dust. 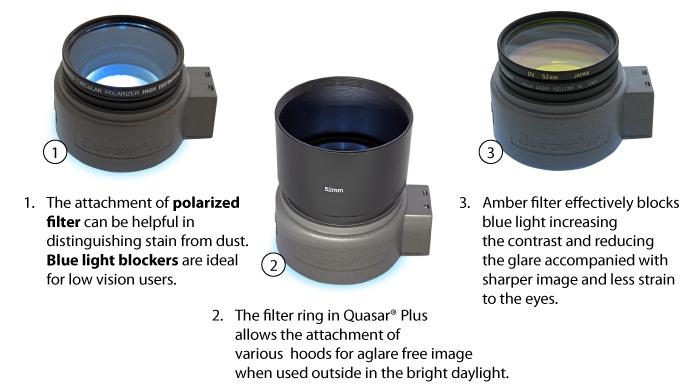 The filter ring in Quasar® Plus 7x Magnifier allows the attachment of various hoods for a glare free image when used outside in the bright daylight. The metal filter rings allows a connection to various camera lens system via connector tube for creative photography. The Bright Vue technology used in Quasar® Plus Sensor Loupe® 7x Magnifier uses six white super bright LEDs with vari-angled orientation specifically designed to create a 3D representation and identify even the smallest spots with heightened eye resolution. The ED Glass (Extra-Low Dispersion glass) and Fluorine coating (MgF2) reduces chromatic aberration and creates a sharper image.